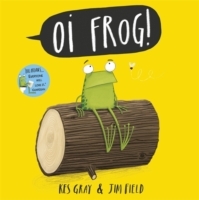 Our favourite new picture book, by the always amusing Kes Gray (of ‘Super Daisy’ fame) Cat bossily tells frog that he can’t sit on a mat because frogs must sit on logs. Then follows a hilarious rhyming list of which animals must sit on what as frog is made to feel more and more ignorant by know-all cat, with a final and very funny uncomfortable resolution for the poor chap. Sara.